No new accounts are being issued for the current Hexagon version. This policy will be reviewed when a new version is released. Many thanks for your interest. This fully featured Demo allows you to try out CNM Hexagon for free. Simply click on the link above to enter the Demo room. You do not need a webcam/microphone to try Hexagon but obviously no one will see or hear you! Convince a friend to join you for the 'full' Hexagon experience! Uses 'standard' web technologies and pictures from your webcam. No installation - If you have Flash 9+ browser plug-in you can run it! Private 'rooms' created for each virtual community. Continually updating 'snapshots' provide tremendous feeling of 'presence'. to see what's going on!" Using only the universal Adobe Flash plug-in running in a standard web browser window, you can keep in touch with colleagues wherever you are in the world, with this secure and private application. For example, get an immediate response from a colleague to a 'quick' question using the inbuilt text or voice chat and most importantly actually see them while you are doing so! A picture can tell you so much... Do they look too busy to contact? Do they have visitors? Are they on the phone? Or just temporarily away? Whether you are working at home for the day, or away at a conference for a while, you can still feel part of the team. Remote working is not so remote any more! You could even consider positioning a few cameras around your workplace to monitor areas like the front door (who is that visitor? ), photocopier room (is it free? ), or coffee area (has a new pot just been made?!). Comprehensive text chat room. Send your message to an individual or to 'all' of the people present. Includes visual and audible indicators for new messages, plus many more features. HexMail - send a message to a registered user not currently in the room and they will see it the next time they enter the room. If you need to speak to someone, they are just a click away! Hexagon includes private easy to use voice chat between two people. 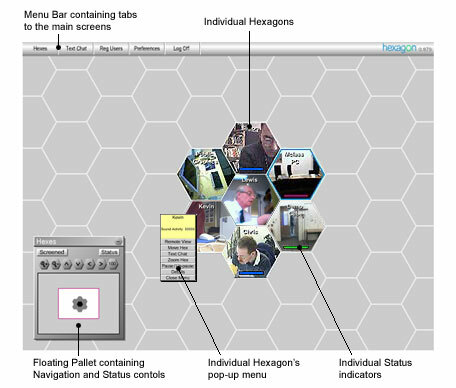 The preferences section lets you personalize many aspects of Hexagon to your own requirements.